When we pack to leave on a road trip we always make room in the car for at least half a dozen jars of my homemade pickled onions. 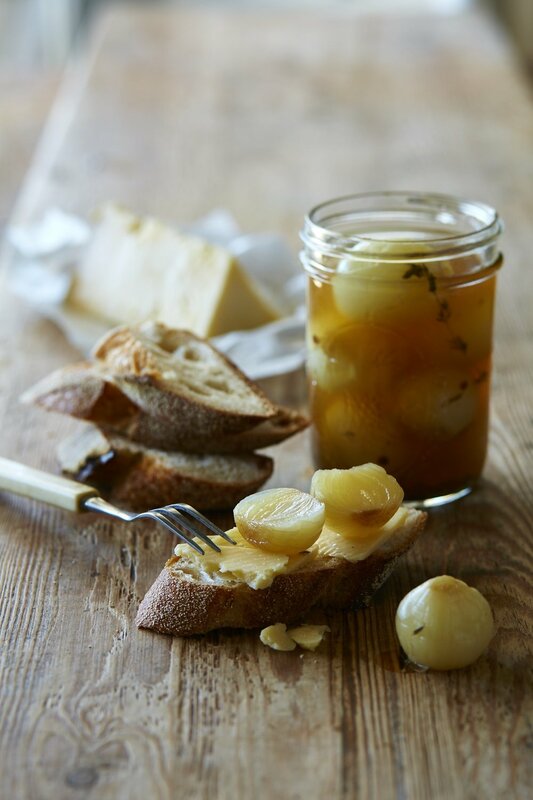 They make the perfect easy sandwich filling with vintage cheese, or popped on a simple cheese platter or ploughman’s plate with an afternoon glass of wine. I’ve been known to gift, sell and trade jars of my pickled onions Australia-wide. 1. Place the onions in a large heatproof bowl and pour over boiling water to cover. Leave to cool. Once cool, trim ends from the onions and peel. 2. Combine the salt and 2 litres of water in a large bowl. Stir until salt dissolves. Add the peeled onions to the salted water. Weigh them down gently with a plate that fits inside the bowl. They must be kept submerged. Cover. Stand at room temperature overnight. 3. Preheat the oven to 160°C (140°C fan forced). To sterilise jars, place clean jars onto a tray into the oven for 15 minutes, to dry and heat. 4. In a large pot place the vinegar, filtered water, sugar and honey. Bring to the boil and then simmer for 5 minutes until all the sugar has dissolved. 5. Drain the onions and rinse twice with cold water to remove the salty water. 6. Remove the jars from the oven. Place the onions and an even amount of coriander seeds, cloves, peppercorns, dill seeds, chilli and a sprig of thyme into the warmed jars. 7. Pour the hot pickling liquid into the jars, leaving a 2cm gap between top of the liquid and the lid. Wipe the jars with a clean, moist paper towel to remove any spillage, and seal with a lid. 8. You can refrigerate at this point and consume the pickled onions for up to 1 month. To preserve for a longer period of time, you will require preserving jars with proper two-piece vacuum caps (consisting of a lid and a band). The jars should then be processed in a hot water bath. Place the jars into a large pot filled with simmering water, covering the jars with 2cm of water. Place a lid on the pot and bring the water to a rolling boil, where it should be held for the entire processing time of 10 minutes. Turn off the heat and remove lid. Let sit for 5 minutes then carefully remove the jars (using a jar lifter for safety). Cool for 12 hours. Note: Test the lids to determine if the jars are vacuum-sealed. Press the centre of the lid to determine if it is concave. Remove the band. Gently try to remove the lid with your fingertips. If the lid is concave and cannot be removed with your fingertips, the jar is vacuum-sealed. Storage: For vacuum-sealed jars, store in a cool, dark place for at least 2 - 4 weeks before opening, allowing for the flavour to develop. Unopened jars will keep for up to 12 months in the pantry. Once jars are opened or if the jars have not sealed effectively store in the fridge for up to 1 month. It was Mr G’s love of both gherkins (baby cucumbers) and pickled onions, served as an afternoon snack on crackers with vintage cheddar that introduced me to enjoying these pickled delicacies. The pickle had been the very thing I would extract and discard from my burger, but now I enjoy them and delight in pickling and bottling my own.